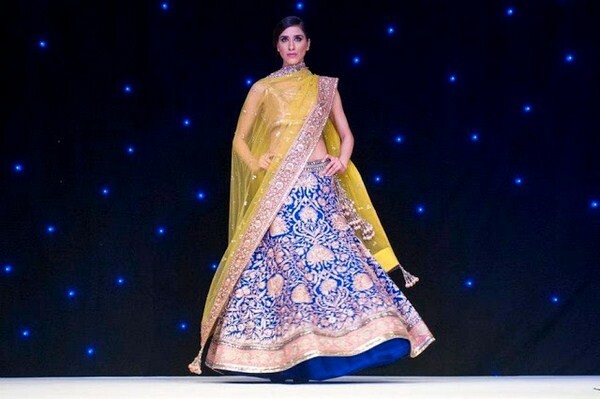 For the upcoming mehndi function, look gorgeous in any of our recommended outfit ideas! One of the most exciting ceremonies in an Indian wedding is most certainly the time when a bride adorns her hands with mehndi. The women singing songs, the heady smell of the mehndi, the blushing bride who sits patiently while a mehndi artist painstakingly etches beautiful designs. This is not just a ceremony, but there is a great significance of mehndi in Indian weddings. The mehndi is a sign of a married woman and they say that darker is the color of the mehndi, more is the love her would-be husband and mother-in-law would be showering on her! No matter how small the mehndi function is, and even if it is held in your home with family and friends, it is still a very special day for you, and the moments will all be captured in photographs! You will be the cynosure of all eyes, and you would want to look your best every single moment! There certainly are some tips that will make you look stunning on your mehndi ceremony. The patterns of henna stretch across till the upper arms of the bride. Henna is also applied on the bride’s feet. That is why the Indian bride needs to wear something that keeps her arms free. Though the ceremony usually lasts two to three hours, it is a messy one and the bride needs to ensure that at the end of the ceremony, she is comfortable and has not messed up an expensive dress. Let’s take you through some of the outfits that you can wear for your mehndi ceremony. All wedding ceremonies are fun, vibrant and very colorful. So being the bride, you should definitely have the best colors. Wear colors that are bright and get them in most styles. Though there are several colors you can choose from, don’t be set on a single color alone. You can choose combinations too. Pastels are very in now and you can mix and match beautiful pastel pinks with greens and blues. Remember, it’s your mehndi, and as long as you can take care of lighter colors and not smear them with mehndi, wear whatever color you want! Yellow, green, orange and pink are the colors that are most widely worn at the mehndi ceremony of the wedding. Of late, beige, off-white and purple are really ‘in’. So you can try them this season. The bridal attire is usually red and that is why, the bride-to-be tries to avoid red for the mehndi. Bright colors such as orange, yellow and fuchsia also make you stand out in the pictures. If you are not a big fan of very bright colors, you can choose beige, baby pink, very light yellow or turquoise too. Just make sure that you choose colors that complement each other. In fact, a nice combination of colors on either the border, or for the dupatta, can uplift the whole look. Multi-colored lehengas are also a rage these days. This also means separates are a great idea. You can mix and match your choli with the lehenga and choose a dupatta of contrasting shades. The first thing to keep in mind while deciding on the outfit is the comfort, of course, without forgetting the style factor. Anarkalis or salwar kameez or kurtas are preferred options – but then take care that you can roll up the sleeves or pajamis. You can play with the embroidery as much as you wish to, but it is better to have it only around the neckline, so you don’t have to worry about the heavy work being stained with the mehndi. This is a new trend that is fast catching up with the brides this season. This is a lehenga lie any other, the only difference being that it ends a little below the knee. This gives the bride a lot of relief from chugging along a heavy lehenga and also makes it easier for the mehndi artists to apply mehndi on the brides. What’s great about the short lehenga is that you can make it in a way which is not heavy and as such it can be much easier to handle it and also wear it on multiple occasions. 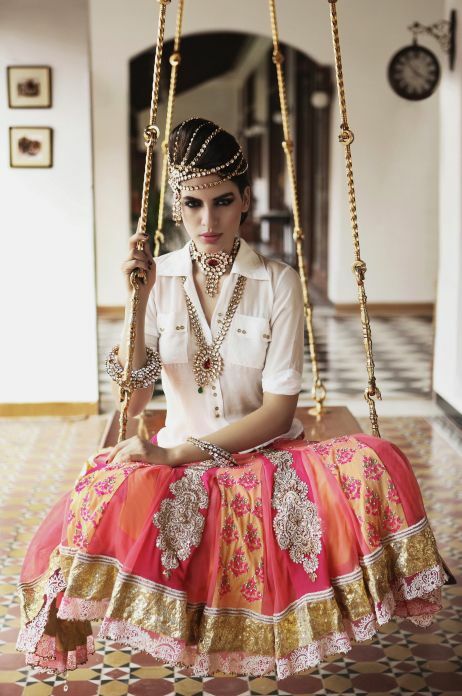 A slit skirt made out of a brocade fabric teamed with an Indian choli or blouse is a practical option. The slit skirt makes it easier for the mehndi artists to make their designs since most of the brides have mehndi way up to their knees. If you are attending a mehndi ceremony and do not have to worry about your clothes getting stained with henna or as a bride yourself, the function is just a formality, you could wear something more trendy yet stick to the theme. Recent trends show that more and more brides are going with clothes which make them most comfortable and also make it easier for the mehndi artists to make their designs. If you are open to going modern with your look, you can choose a comfortable pair of shorts, knee-length pants or a knee-length skirt. These, you can team with a nice embroidered jacket or top You can even wear a pair of shorts! Dhoti pants are a super chic idea too! Just make sure that you infuse some bit of creativity in your ensemble so that it looks like an Indian wedding! Makeup matters: While choosing your makeup, do keep in mind that you will have to sit still for a really long time as the mehndi artist applies mehndi on your arms and feet. Even after they are done, you will have to stay still until it dries. So, touching up your makeup can be almost impossible, unless someone helps you with it. Choosing waterproof, long-lasting makeup would be the best bet here. Apart from that, make sure your makeup colors are in sync with your outfit. You can play with the colors as much as you want to, just avoid going overboard. Trendy hair: When it comes to hair, a neatly tied bun or braid would make it more comfortable for you to sit for hours. But, if you wish to leave your hair open, you can just pin-up the front section, so it does not keep bothering you on the face.